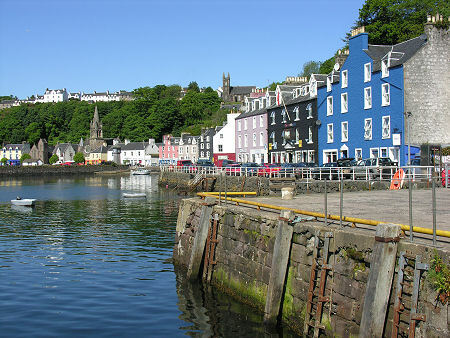 Tobermory owes its origins to the British Fisheries Society and their search for likely sites for fishing communities in western Scotland in the 1700s. The Society's agent, John Knox, visited Mull in 1786 and proposed making use of the superb natural harbour for such a community. The name comes from the Gaelic tobar-mhoire which translates as "Mary's Well", after an ancient holy well dedicated to the Virgin Mary in what is now the upper part of the village. 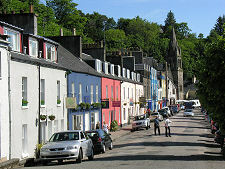 Today Tobermory, the undisputed island capital of Mull, has a population of just over 1,000 people. These days it is perhaps best known for its connections with children's TV. First it had a Womble named after it, while a little more recently it was used as the setting for the BBC children's series Balamory. 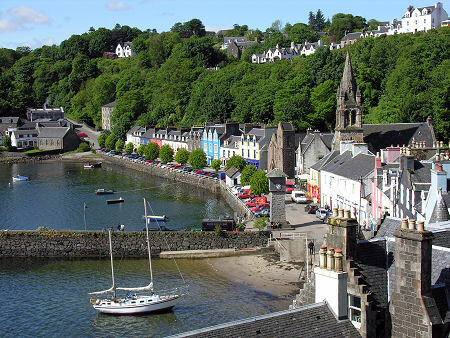 This turned Tobermory into a place of pilgrimage for many young fans and their parents. 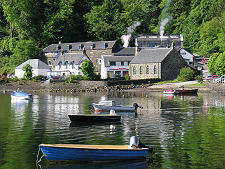 Although filming stopped in 2005, the appearance of the series on DVD means it still pays to book your accommodation and ferry tickets ahead if you intend to visit. Tobermory wraps around the bay that led to its construction. 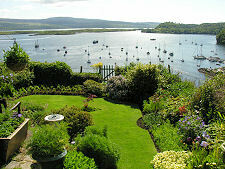 It faces south east into the Sound of Mull, and is additionally protected by Calve Island which half encloses the bay. Main Street hugs the harbour, with additional development on the hillside behind. 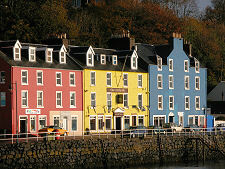 Tobermory's most distinctive feature lies in the brightly painted frontages of many of its buildings. 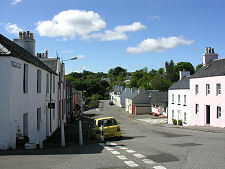 The pink, yellow and blue run of the three buildings centered on the Mishnish Hotel near the south east end of the harbour was for many years the most striking segment. 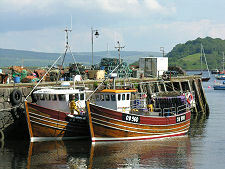 In 2006 the palette changed, with the Mishnish being painted a more traditional black and its previously bright pink neighbour being toned down. 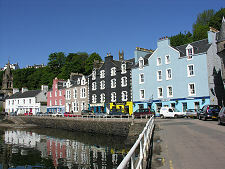 The Mishnish Hotel has been returned to its earlier yellow since our most recent visit, and Tobermory has returned to being the brightest and one of the most attractive harboursides in Scotland. 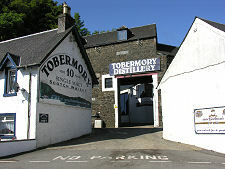 At the west end of Main Street, where the road from the south descends to the harbour, is Tobermory Distillery. Visitors find a superb little craft distillery with a considerable amount of character. 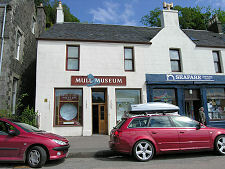 Further around the harbour is the tiny but fascinating Mull Museum, home to a wide range of displays about the history, geology, geography, culture and people of Mull. 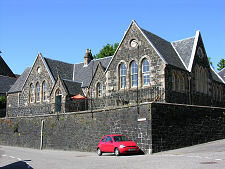 Meanwhile, at the top of the steep path that runs up past the old post office is An Tobar, an arts centre, gallery and café in a converted school. Not far away from An Tobar is the village's RC Church of Our Lady, Star of the Sea: very unassuming externally, but with a very attractive interior. Meanwhile, Tobermory has no shortage of cafés, pubs, hotels and restaurants to cater for the hungry or thirsty visitor, plus a theatre. 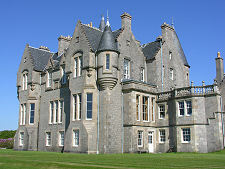 A few miles north west of Tobermory is Glengorm Castle, offering those wishing to stay 4 Star B&B accommodation in a unique location, plus a range of self catering options, set in beautiful gardens. The Glengorm Estate also has as a coffee shop, farm shop and art gallery in converted steadings close by, plus some magnificent walking in this remote area of north Mull. Another draw to Tobermory may or may not actually exist. The remnants of the 1588 Spanish Armada were widely scattered. It is said that after navigating its way around northern Scotland, one of the ships ended up in what is now Tobermory Harbour. The story goes that having stocked up for their onward journey, the Spaniards started to leave on 5 November 1588 without paying for their goods. Donald Maclean of Duart boarded the ship and ignited its powder magazine, sending 350 Spaniards, their ship, and himself to the bottom of the harbour. This seems a drastic remedy for non-payment of bills. Accounts differ as to whether the ship involved was the cargo ship Almirante di Florencia or the troop ship San Juan de Sicilia. The difference is significant: the first was believed to be carrying large amounts of gold, the second wasn't. Over the years the possibility of treasure in the harbour has led to many attempts to find the wreck. But if it ever existed at all, it has still to be found. 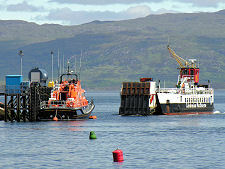 Of the various ferries to Mull, one does link direct to Tobermory. This is the ferry that runs to Kilchoan, near the western end of the Ardnamurchan Peninsula. It is debatable whether this can be thought of as linking Tobermory to the mainland, or one of the most remote parts of the mainland to Tobermory. Another regular visitor to Tobermory is the small cruise ship Hebridean Princess.